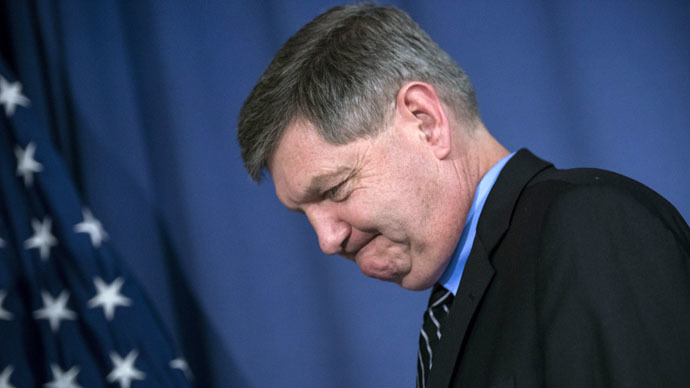 Pulitzer Prize-winning journalist James Risen will not be asked to testify at the upcoming trial of a suspected source, former CIA employee Jeffrey Sterling, ending for now the writer’s seven-year-long ordeal with the Department of Justice. On Monday, US prosecutors said they won’t call Risen to the stand when the government’s federal espionage trial against Sterling begins this week. Jury selection is scheduled to start Tuesday. The Justice Department has long sought testimony from Risen in hopes of having the writer confirm that Sterling, a former intelligence agency operations officer, unlawfully disclosed classified intelligence about the Iranian nuclear program described in Risen’s 2006 book, State of War. But the writer has refused to answer as to the identity of his source, deferring subpoenas issued under two different presidential administrations and repeatedly and publicly defying the government’s requests. "Mr. Risen has indicated under oath, without hesitation or equivocation, that he will not answer questions that go to the heart of the case. As such, he is unavailable for purposes of the trial and neither party should be permitted to call him as a witness," prosecutors wrote in a motion filed Monday in US District Court for the District of Colombia. At one point, Risen risked the possibility of serving jail time for refusing to testify in the case against Sterling, who is accused of violating the espionage act by leaking CIA intelligence. Attorney General Eric Holder said last September that the DOJ would not seek imprisonment, though, easing the government’s pressure on the journalist for the first time since they first subpoenaed him seven years earlier. Sterling was the fifth government employee to be charged by the Obama administration under the Espionage Act of 1917 for allegedly leaking government information.